Barcel Takis Nitro are mini corn tortilla chips that are rolled up like a small taco (similar to the deep fried taquitos). These tasty tortilla chips are covered in delicious lime and habanero, so each bite is full of crunch and spice. This is a great snack on the go, whether you're having a party or are just craving a salty and spicy snack. Takis new flavor is sizzling good. Ingredients: corn masa, vegetable oil and seasoning (maltodextrin, salt, citric acid, dextrose, monosodium glutamate, sugar, onion powder, natural flavoring, (FD&C red #40 lake), garlic powder, gum acacia, (FD&C yellow #6 lake, FD&C yellow #5), tecopherol, mannitol, (FD&C blue #1 lake), natural identical flavor. Takis Fuego Nitro son Mini Rollos de Tortilla de Maiz, que estan cubiertos con chile habanero y limon ardiente, para que cada mordida sea crujiente y llena de fuego. Es una buena botana para disfrutar en cualquier parte, asi los sirvas en una fiesta o tengas antojo de una botana picosita. El nuevo sabor a takis esta que arde! Ingredientes: masa de maiz, aceite vegetal y condimentos (maltodextrina, sal, acido citrico, dextrosa, glutamato monosodico, azucar, cebolla en polvo, saborizantes naturales, (FD&C rojo #40), ajo en polvo, goma de acacia, (FD&C amarillo #6, FD&C amarillo #5), tecopherol, manitol, (FD&C azul #1), identico sabor natural. The first bite is a almost off-putting, but then the fruitiness of the habanero flavor really comes through, and then finally some heat. It's a little more complex than some other flavors (i.e., Fuego) that just blast you with heat. But it probably doesn't dethrone the GOAT that is Xplosion. 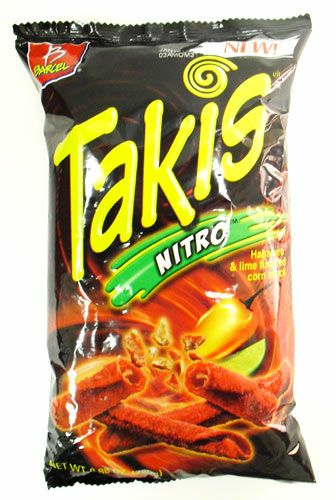 These taste almost like the FUEGOtakis but a tiny different, cant explain, but also really good, is just ordered two bags of these and 3fuego.